At Stodec Products, we have a wide product range of industrial pallet racking systems for warehouses and storage facilities to meet any requirement. We can carry out a full site survey to understand your storage needs, then supply and expertly install custom racks that will ensure the handling and storage of stock is efficient and safe. Racking is the ideal solution for warehouses that require a flexible system, as it can be adapted to suit any size or shape of stock, and moved to accommodate a change of layout. To find out more about our robust racking systems available nationwide, simply get in touch today. Our range includes world leading Speedlock, P90, Dexion Longspan and specially designed structural galvanised heavy duty racking for outdoor use in the most extreme conditions. 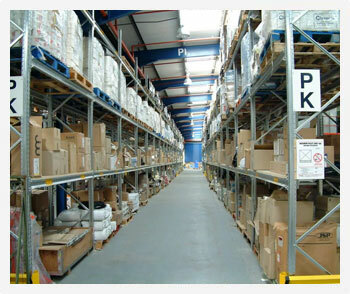 Some details of the pallet racking ranges are shown on our “Online Store” section under “Storage”. The racking section under “Downloads” includes full details of pallet racking systems including Drive-In, Pallet shutters, Mobile as well as standard adjustable racking. Contact us for advice on the most effective and economic racking design for your goods.